Neil McFarlane became TriMet General Manager on July 1, 2010. Previously he served as TriMet’s Executive Director of Capital Projects (1998-2010) and the agency’s Project Control Director on the Westside Transit Project. TriMet General Manager Neil McFarlane will retire after more than seven years at the helm of Oregon’s largest public transit provider. McFarlane, age 65, announced on Wednesday, Oct. 18, 2017, that he would retire in early 2018. McFarlane has been with TriMet since February 1991, serving as general manager since July 1, 2010. The agency and TriMet’s Board of Directors will now launch an international search for the next general manager, including holding listening sessions with community stakeholders and soliciting public feedback. Under McFarlane’s leadership, TriMet has become an important partner in the efforts to create livable communities and keep the Portland region moving, garnering the respect of national transportation leaders. Through his years of service, he led the expansion of TriMet’s light rail system, which has become a national model for integrating land use and transportation planning, policy and development. As general manager, McFarlane began a 10-year expansion of bus service and laid the groundwork for future service enhancements to meet the needs of our growing communities. He led the agency’s recovery from the great recession and put TriMet on a strategic financial path. He championed a culture of safety and continuous improvement inside TriMet. McFarlane fostered a commitment to diversity, equity and cultural competence. And, he pushed the agency forward on investments and innovations to improve service and the overall customer experience, while reinvesting in the existing system. During his years at TriMet, McFarlane helped lead the expansion of the MAX Light Rail System from a single line, 15-mile system to the five-line, 60-mile system that serves communities from Hillsboro to Gresham and north Portland to Clackamas County. He also brought the first commuter rail line to Oregon and made a lasting mark on TriMet’s bus system. 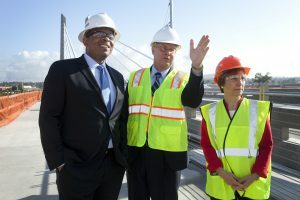 Secretary of Transportation Anthony Foxx stands with TriMet General Manager Neil McFarlane and Congresswoman Suzanne Bonamici on the Tilikum Crossing, during construction in 2014. First-of-its-kind bridge in the nation: Tilikum Crossing, Bridge of the People, carries buses, trains, streetcars, pedestrians and bicyclists but no private cars. First low-floor accessible rail vehicles in the U.S.
McFarlane faced early challenges as general manager including the great recession. Lower-than-expected employer payroll taxes, anticipated cuts in federal funding and unsustainable health care costs led to a $12 million shortfall. Based on the feedback from a budget task force he assembled and unprecedented public outreach, McFarlane preserved as much service as possible while implementing a multi-pronged approach to close the financial gap. McFarlane has long held the belief that access to transit is access to opportunity and has championed diversity and equity in TriMet’s standards and policies. He’s also advanced inclusive business practices and community partnerships while bringing more voices to conversations about the transit system. McFarlane launched a number of innovative projects to help customers and improve the overall customer experience. McFarlane also has instituted an environment of continuous improvement inside TriMet to better serve riders and the public. Taking the helm following the worst collision in TriMet history in April 2010, McFarlane prioritized safe operations and a culture of safety. 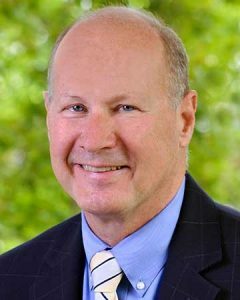 While McFarlane was part of the growth of the MAX Light Rail system, he now finds himself part of the rejuvenation of it as the system has reached the age for necessary repairs and replacements. McFarlane also reinstated TriMet’s bus purchase program bringing the average age of the fleet from 14 years to less than 8 years. TriMet provides bus, light rail, commuter rail and paratransit services across a 533-square-mile district of the Portland, Oregon, metro area, connecting communities while easing congestion and reducing pollution. More people ride transit in the Portland area than in larger cities such as Dallas, Denver and San Diego – with nearly eight out of ten riders choosing TriMet over driving. Portland ranks 9th in per capita transit ridership, even though it ranks 24th in population. In fiscal year 2017, TriMet provided nearly 99 million trips.